After meeting up with Andy on Sunday morning myself, Andy & Jess set off for my old nemesis: Giants Hole round trip. 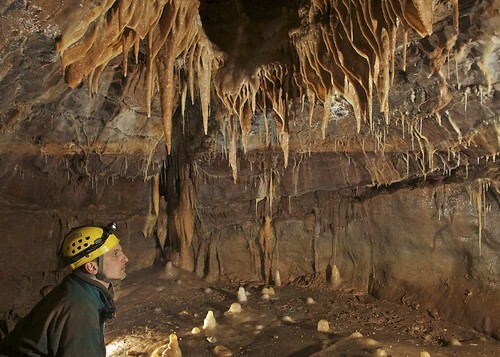 We arrived with 3 cars in the car park and a group of half a dozen cavers heading off. We changed quickly and were just setting off for the cave when another six cars came down the track. Eager to get in ahead of the crowds Andy led off toward the entrance with myself and Jess in tow. At Base Camp Chamber we caught the first group and went on to Garlands Pot where Andy rigged the ladder & the 3 of us were down and in the Crab Walk in short order. Andy took the lead, pointing out spots where I’d need to either drop to the water or climb up the slightly tighter sections. At The Vice Andy went through without a problem followed by a slightly more hesitant me. Andy decided it would be easier if I were to face the opposite way to get through so I backed up and sent Jess through first to show me how it was done. Watching her slip through with ease I launched myself at the opening, sliding, sliding, sliding, stuck. With Andy shouting to just relax and that it wasn’t like I could drown or anything, I turning my head left to see if I was positioned in the widest part, water poured over my shoulder & into my nose and mouth. Spluttering I turned my face away to catch my breath. Now the more intelligent caver would have learnt from this, for some reason (perhaps my intelligence level?) I decided that doing exactly the same action would result in a better outcome. Needless to say I managed to water board myself a second time…. Doh! Again spluttering as I tried to drown myself I reached out for Andy and he grabbed a hand and I was through in no time. The rest of the cave was a joy, up through the climbs, doused in the Wind Pipe, through the calcite polo and over the traverses with ease. Out of the cave after only a couple of hours the sun was shining and it was back to the car. Changed and ready to go another half a dozen cars rumbled down the track, obviously they’d heard that the famous cave diver was returning to Giants, though I think my fear of the squeeze has now been conquered & from now on I will take the slightly less lofty approach to The Vice in future. As ever I couldn’t have done this without the cussing and encouragement of my team mates. 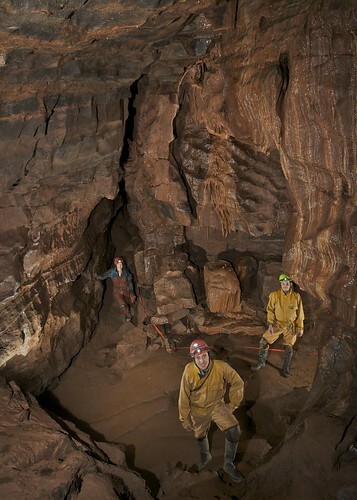 A reasonable amount of rain fell on Saturday making the proposed trip into Dan Yr Ogof look quite risky, so instead we decided to change the plan and head to Cwm Dwr as a safer alternative. Messages were left on answer phones and we headed down to South Wales, four of use meeting at the breakfast van, but no sign of Ben or Grant. Ben had missed the phone message and after a night on the beer was waiting on the DYO carpark. Keith headed into the cave with Heather and Mark, while Brendan waited for Ben and Grant to arrive and change. Keith was trying out some new video lighting and set to work filming Heather and Mark in the entrance series. With Ben and Grant changed the final group entered the cave and met up with Keith in the entrance series and then made steady progress into the cave taking some video as we went. We headed to The Smithy and then via Sand Banks to Piccadilly, where Keith headed off with Mark to see if he could post Mark through The Letterbox. The rest of the group headed down to the sump and then along Flood Bypass to the Confluence. From here we headed up the Cwm Dwr Stream to emerge into the bottom of The Smithy, our agreed rendez-vous point with Keith and Mark. Keith returned with Mark confirming that although classed as a Large Letter by the Royal Mail, it was possible for Mark to pass through the Letterbox. From The Smithy we headed out taking a couple of photos and some video on the way. Heather, Ben and Grant near Big Shacks in Cwm Dwr. Grant near the sump in Cwm Dwr Quarry Cave. Ben near the sump in Cwm Dwr Quarry Cave. Saturday 11th and Sunday 12th February. After a great weekend of caving with the club at South Wales Jess and I realised that if the rescue on the Saturday had been more than an iced door, then without knowing our way around we’d have been of very little use. We therefore decided to have a go at a little navigation around the Ogof Ffynnon Ddu system. The week before, Keith had challenged us to find our way to Gnome Passage which, after a fashion, we did and although we managed to go the very long way around, we had begun to get a feel for the entrance to the system. With significantly less snow on the ground we set off on Saturday morning with the intention of having a ’play‘ in Top Entrance. To my surprise we found our way to Gnome Passage straight away without any problems. We went to the end of the passage to check we could recognise the beginning of Edward's Short Cut, which we did, and after this made our way past the Wedding Cake to the Corkscrew boulder choke and down in to Salubrious Passage. We followed this to the Trident and the Judge and then skipped across the traverse and in to Selenite Tunnel to Shatter Pillar. We made our way back to Crossroads and went to see the top of Maypole Inlet climb then retraced our steps back up the Corkscrew boulder choke & on to see the Chasm. Feeling very chuffed that we had no navigational errors we crossed Gnome passage back to White Arch, then back to the Brick Yard. Finally we popped up in to the Bedding Planes for a nose around before heading out. Sunday saw us doing a repeat of our round trip with Brendan in OFD1, again route finding went extremely well and within a couple of hours we had made our way up the Toast Rack, over the pots and upstream to Lowe’s Climb, through Roundabout & Pi Chambers and down to Bolt Traverse, back to the stream way and out via Pluto’s Bath. A thoroughly enjoyable weekend with no ‘events’ for a change! Present: Mark Burkey and Jessica harding - Trip report by Mark. I remember as a teenager seeing men land on the moon, a great adventure, but the reality is only a handful of people have set foot on the moon, yet here on our planet, in fact here in the UK is an adventure for us everyday people to sense that buzz of discovery. Welcome to Dudley Caving club, just on my third caving trip we explored the caves of the Brecon Beacons caving system in Wales, on a cold weekend with the landscape filled with crisp white snow and a chill in the air we descended into the caving system. Suddenly we was away from the outside world of cold and snow, almost welcome was the warmer air and the comfort of stillness and the sense that we was on our adventure.You too can feel that feeling, come and say hello and have a go, the world is not just what you see above the ground or in the sky but What lies beneath . 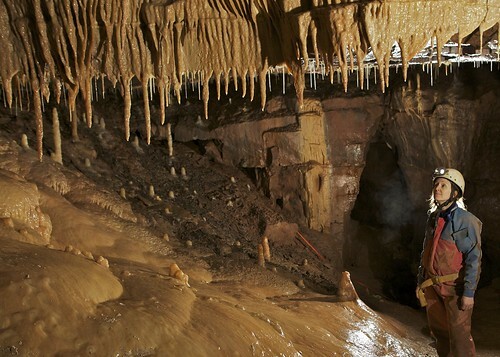 More to follow on our caving trip. After their introduction to caving by John Smith on the previous day, I was told that the ‘new lads’ would like something a little tastier. A through trip would have been nice but with snow melting and water levels likely to rise it was decided that the standard Sunday trip, i.e. a Round Trip in OFD 1 would have to suffice. We started up the Escape Route and at the first crawl in water the new lads shouted that this was just the sort of thing they were looking for. At the dug-out they shouted with joy. The traverses above the streamway were tackled with gusto. They shot up the chimney climb like proverbial rats up a drain pipe. Nothing it seemed would be too much for them. We ambled through the upper levels and met the other team on the climb down to Lowe’s Passage. At Lowe’s Climb they treated it like an abseil with wellies against the wall. Nothing, it seemed, was going to faze them, so I made them climb up again. No problem. So it was off to Boulder Chamber where they were introduced to the joys of their first boulder choke. They lapped it up. Back though the choke I decided to play my trump card. I made them climb up the traverses to the waterfall for the sole reason of making them climb back down the waterfall, which incidentally was flowing freely. This surely would dampen their spirits. Not a chance. Whoops of joy resonated around the cave as they emerged from under the water. This is exactly what they wanted – bring it on, but there was nothing left other than the water slides in the stream which they found so good that they went back for seconds. Finally I tried traversing around Pluto’s Bath – hoping that my bright light would blind them enough for at least one to fall in. They sussed what I was doing but decided to dive in anyway. With me completely defeated we exited the cave. With such a great turn out of new members we split into two groups to head into OFD 2 for the first days caving. It was minus five with a strong wind and icy snow starting to fall when we put away the teapots and headed up the hill towards the cave. Deep snow drifts filled the entrance to the cave and after a little moving of the snow we were on our way. This group was exploring the passages around the entrance, and we went no further into the cave than Gnome Passage. Our first objective was to head up to the Mini Columns and explore the labyrinth of passages in that area. With several circuits made we set off to give Mark and Jess a navigational challenge of leading the route to Gnome Passage. Despite taking us down some passages that none of us had ever been down before, we arrived in Gnome Passage before setting off on our next objective, the Bedding Chambers. A climb up a steep calcite slope took us up into the maze of passages that make up the Bedding Chambers, where we spent an hour or so exploring all the routes. Once we thought that we hade covered all route, Keith beckoned us into another passage he had spotted at the top of the calcite slope. We soon followed to find an impressive grotto and a passage beyond that led through a boulder squeeze into a chamber. The chamber was back on route to the Mini Columns and so we decided to split and meet back at the bottom of the calcite slope - our original route into this area. Mark and Jess were left to navigate the second party, which they did successfully, albeit by a slightly longer route that strictly necessary, taking in Gnome Passage on their travels. Once regrouped, we headed out of the cave to fight our way through the now much deeper snow. Frozen pipes meant no hot showers, but made up for it by thawing out infront of a blazing fire in the long common room. Another party were overdue on a OFD through trip, and meant that we missed our traditional visit to the pub, instead donning our cold wet gear to prepare for a search. The group was found by Keith, Mark, Jess and Graham as they fought with a an iced-up gate to exit the cave. John on comms relayed the message that they were safe and saved the second party from setting off on a through trip to search for them. 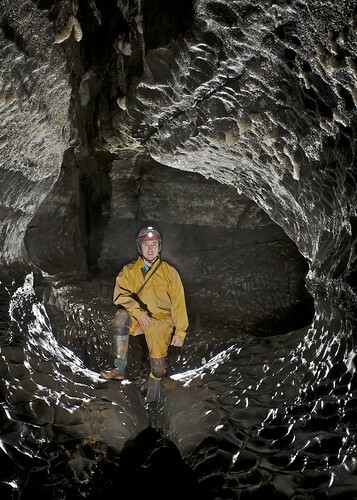 Dominik viewing formations in the Bedding Chambers. 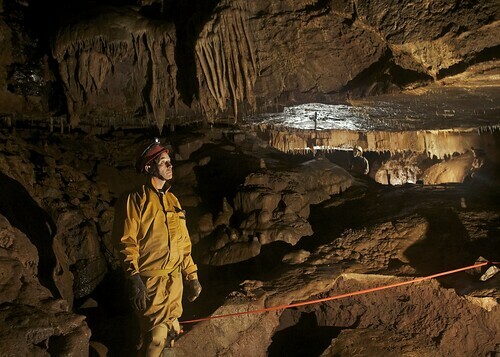 Phil viewing formations in the Bedding Chambers. 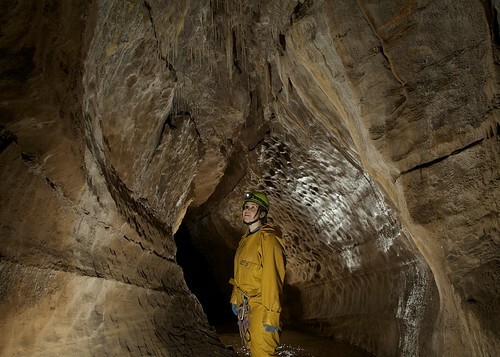 Mel viewing formations in the Bedding Chambers. Trip Report to be added later.